Pallets LLC is a reputable pallet manufacturer company. Why Go With GreenBlock Pallet? FACT #1: GreenBlock is less expensive than the traditional wood pallet. 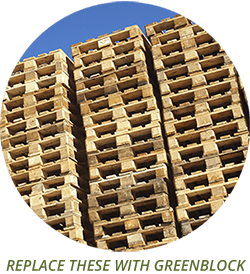 FACT #2: GreenBlock is a durable, eco-friendly revolution in materials handling. FACT #3: GreenBlock Pallet will reduce the weight of the GMA pallet by over 50%. FACT #4: Pallet manufacturers will be able to double the number of pallets shipped per truckload. FACT #5: GreenBlock, not only will you save trees, you’ll save time, and you’ll save money. WHAT DO OTHERS THINK OF GREENBLOCK? Our clients love it. See for yourself! See the GreenBlock in action! This is an example of a two-stringer wing pallet made with GreenBlock, only one of the countless configurations possible due to GreenBlock’s modularity. A GreenBlock Pallet with a three-tier product load. A GreenBlock Pallet is loaded with four tons of plywood. The four-ton load is successfully supported by nine GreenBlocks that in total weigh less than two pounds. A forklift loads the third tier of product on a GreenBlock Pallet, bringing the load to 3,600 pounds. A GreenBlock Pallet is loaded with 3,000 pounds of lumber. A GreenBlock Pallet withstands being dragged forward and backward under a 3000-pound load. 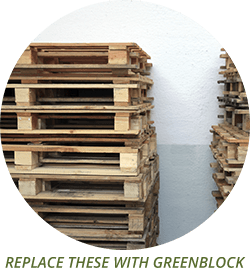 A GreenBlock Pallet resists forklift abuse from spreading tines or scooting. A loaded GreenBlock Pallet withstands being pushed by a forklift across a warehouse floor. A properly attached GreenBlock withstands repeated blows from a hammer without deforming or detaching. A GreenBlock Pallet carries a load from a roller conveyor to a chain conveyor. A GreenBlock Pallet carries a load on a chain conveyor. A GreenBlock Pallet carrying 3,000 pounds of lumber moves on a roller conveyor. A loaded GreenBlock Pallet moves from a roller conveyor onto a turntable for stretch wrapping. A loaded GreenBlock Pallet is stretch wrapped on a turntable. A loaded GreenBlock Pallet is racked across length on a wire support racking system. A loaded GreenBlock Pallet is racked across length on a two beam support racking system.